On Saturday July 15th 2017, a unique aerial dance and visual show took place in Madrid. Young flyers from around the world and their coaches performed choreographed flying performances to light and music. The sensational performance was streamed live across the world and has gained almost 140,000 views to date! The invitational event brought participants from around the world to Madrid Fly. The training camp was dubbed the Superheroes' Camp. The event was co-organized by the facility and the Hungarian Space Devils Sports Club. The successful performance comes hot on the heels of Inka Tiitto's performance on America's Got Talent. The beauty of choreography to music has brought massive public awareness to the sport of bodyflight. This is sure to help push the industry forward. The 10 students represented a wide range of countries around the world. The young and talented cast is a massive inspiration! This event continues Space Devils Sports Club's active work to push indoor skydiving events and competition to the mainstream consciousness. The team hopes to continue to pursue these types of events. 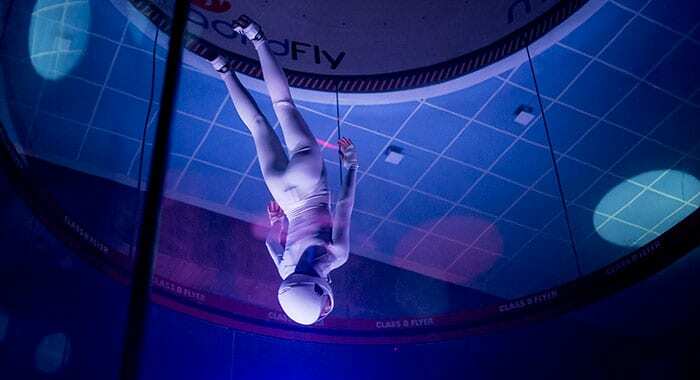 In addition they lead the several-thousand-member movement to introduce indoor skydiving as a sporting discipline in the Olympic Games. During the camp, a documentary was to serve the purpose of promoting the sport. The movie will be available on the channels of Space Devils Sports Club, and the organizers also hope to screen them at European film festivals. We would love to know what you think of the event! Leave your thoughts in the comments below.